A 51-year-old female was flown to a Oklahoma City hospital following a roll over accident at Division and Prairie Grove Wednesday evening around 5:40 p.m. 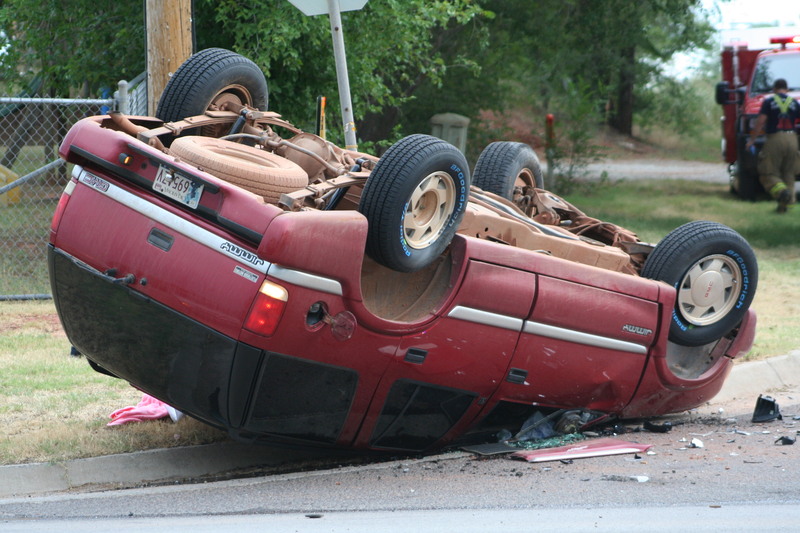 This red SUV flipped over in a two-car accident Wednesday evening on South Division. Less than an hour later, Guthrie EMS was called out to Highway 33 and Broadway for another two-car accident that left one car blocking one lane of traffic and the other vehicle in a ditch. There were no injuries reported at the scene. The Division and Prairie Grove two-car wreck left a female driver with a severe laceration to her left arm. She was shortly flown by EagleMed to Baptist Hospital. It appeared the red SUV vehicle, driven by the injured woman, was southbound on Division and turned in front of the northbound vehicle that was attempting to go east on Prairie Grove resulting the SUV rolling on to its top. Guthrie News Page will update as more information is gathered.